… Before It’s Too Late! SOS: What are they putting in the black chemtrails? If you don’t know already, the entire country is under assault by nonstop chemical geoengineering operations via chemtrails and atmospheric chembombs. The monster storms hitting California are the direct result of these intensified chemtrail operations. So are the numerous out-of-season tornadic storm systems devastating the Deep South. As a matter of meteorological fact, Trumpland throughout the South and Midwest has been really taking a beating ever since Election Day. Many of these highly destructive and unseasonal weather events are not even showing up in the Mainstream Media (MSM) of late. Unless you are a victim yourself, or know folks who have been, the American people are mostly unaware as many of these frankenstorms go totally unreported outside of the local area. What exactly does that mean? That the MSM is quite deliberately not disseminating important weather info, especially to those areas that are the hardest hit. Why in the world is there so much non-disclosure — BY THE MEDIA — when their very job is to function as a public service to local communities everywhere? From our seat, there appears to be no location within the 50 states that is immune to a regular dose of chemical geoengineering. Everyone is now remarking about living under direct weather threats—24/7. California has become the site of Weathergeddon, USA. The southern states are likewise being constantly terrorized by hurricane strength mega-storms that destroy whole towns as they paralyze cities like Albany, Georgia*. Why are you allowing the geoengineers to continue to wreak such havoc, particularly in the states that made your historic election possible? Surely it’s obvious by now to Team Trump that the secret, supranational body, which controls these chemtrail operations worldwide, is using them to sabotage local economies around the country. After 8 calamitous years of Obama’s gross negligence, not only are small businesses collapsing left and right, dilapidated infrastructure is failing wherever it’s tested by natural and/or manmade catastrophes. The globalist cabal is intentionally engineering these natural disasters to force the expenditure of more federal money that is needed elsewhere. Hence, the geoengineering programs that are being conducted unrelentingly in the skies across the nation are making it virtually impossible to Make America Great Again. What more effective way to prevent you from fulfilling your campaign promises is there than keeping you preoccupied with one weather emergency after another? Look it, we expected such weather terrorism to be conducted by the treasonous Obama administration. We did NOT expect that such a geoengineering regime of weather manipulation and climate sabotage would worsen under your presidency. And yet it has! Dear President Trump, you are the Commander-in-Chief of the U.S. Armed Forces. In that capacity you are ultimately responsible for the incessant weather terrorism being perpetrated by the U.S. military against the American people. Should you doubt this crucial fact, please consult the following two exposés. Now you know that you, Mr. President, are actually in charge of these chemtrail aerosol spraying programs nationwide. And, yet, has anyone briefed you on their real purpose … or what they really spray … or what the public health consequences are? For example, are you familiar with CHEMTRAIL SYNDROME: A Global Pandemic Of Epic Proportions? Based on the accurate answers to each of these and other very important questions, your constitutional responsibilities demand that you terminate them—YESTERDAY ! ! ! One direct command from you simply shuts down the whole God-forsaken Global Warming project. Yes, they even spray chemtrails over Washington, D.C. Please be aware that the chemtrails you see in the sky all over D.C., NYC, and WPB are an integral piece of the New World Order agenda to fabricate a Global Warming scenario. Were it not for a few very sharp scientists, the geoengineers might have gotten away with this exceedingly misguided and nefarious scheme. You are so right to dismiss the Global Warming scam, not because the geoengineers haven’t forced the regional temps up year by year; rather, because they have purposefully geoengineered the ruse to advance the GCC agenda of their globalist masters. 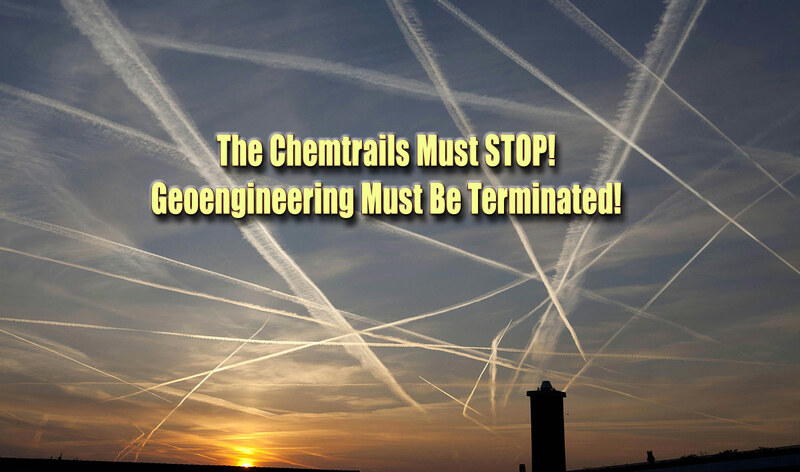 The deliberate marriage of chemical geoengineering with satellite-based HAARP technology has enabled the geoengineers to take solar radiation management (SRM) to a whole new level. SRM is just another way to justify the creation of enormous chemcloud cover across the planet. Which invariably contributes to the manifestation of their Global Warming scheme. In conclusion, may we respectfully request that you take some time to read the following back story that you will not read anywhere else. It will show you how the globalists fabricated the current Global Warming narrative to blame it on human activity that generates CO2. In this way they have manufactured the ongoing Great Recession which they hope will eventually lead to a totalitarian One World Government. This is what TPTB did. They saw that the planet had entered a period of global warming. This occurred during World War II when they had to track the weather very closely for wartime purposes. The slight but steady warming of the planet paralleled the same period when the Oil & Gas Industry really began to take off and the global population explosion first began. At the time, when the data really started to pour in, the warming was just a small campfire … this was early on, right after World War II. Soon after they first made those observations about the slow warming of the planet, the decision was made to turn what was really a little campfire into a raging wildfire. They experimented with HAARP and used Chemtrails and other geoengineering technologies to ramp up the heat. Eventually the wildfire of global warming was stoked sufficiently so that full-blown forest fires, brush fires and grass fires were jumping off anywhere and everywhere. In this way the synthetic component Global Warming was fabricated on top of a very real phase of planetary heating. In light of these explosive revelations about this Global Warming scam, we would hope that you will SHUT DOWN the chemtrail spraying for good. The NWO globalists are literally poisoning us all so that they can use global climate change as a weapon to control US even more. It’s way past time for this premeditated weather terrorism to stop, yes?! Please, President Trump, shut these toxic #$§@&∅%£*?€! chemtrails down asap … and forever. By the way, we also sent a very serious request to Pope Francis as he has significantly contributed to the false narrative which promotes global climate change via CO2. You would probably enjoy reading this respectful chastisement of the Pontiff. P.S. We sincerely apologize if the tone of this “Open Letter” may sound demanding, or even presumptuous. However, that’s only because we have seen no response whatsoever from your administration to our last letter to you linked below.